Go well beyond just boosting posts or running ads. Target in-market buyers and vendors. This goes way beyond boosting posts. Get access to Australia’s most powerful Facebook ads platform for real estate. Available to every agent. 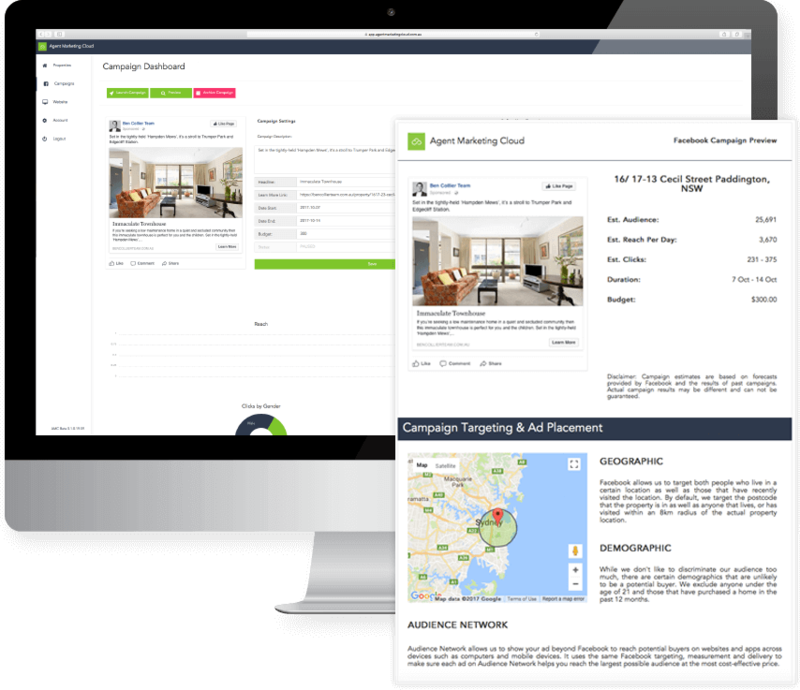 Agent Marketing Cloud generates buyer leads and sales for your real estate business on Facebook by using powerful data to target your listings to potential buyers using our audience targeting algorithms. AMC allows you to easily target advanced audience segments including first-home buyers, empty nesters, retirees, large families, small families, investors, upgraders or developers. When it comes to how many people view your properties online, some of our clients have reduced their costs by up to 75% to reach buyers on our platform compared to the major portals. Whether you’re chasing brand awareness or leads, our Agent Profile ads put you front-and-centre in the minds of local homeowners. Using either a photo or video, promote your profile to local homeowners and investors. You can also target ‘out-of-area’ sellers and investors with additional geo-targeting capability. Combine your ads with one of our Vendor Lead Sites and start mining leads from interested sellers in your local market! Setting up ads on Facebook can be a nightmare. We’ve made it simple. 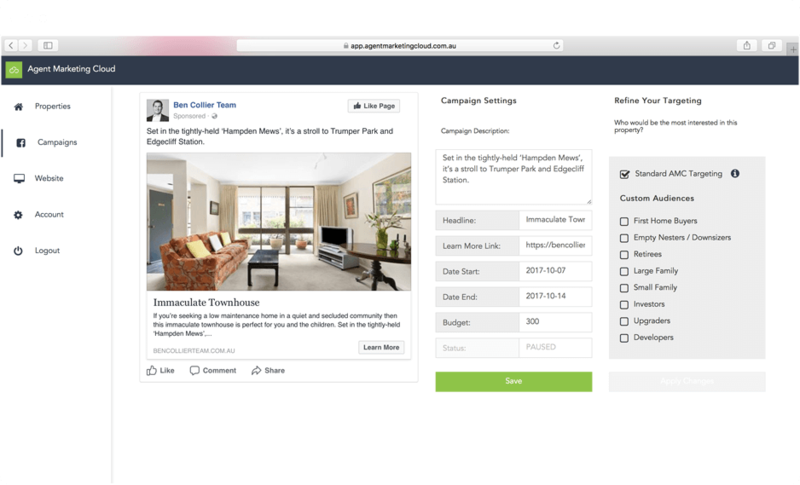 From uploading property details, website links, feature photo or video, to launching your campaign, it’s never been easier to setup Facebook Ads for your listings or to promote your profile. Say goodbye to the old ‘spray and pray’ approach. Say hello to relevant advertising. 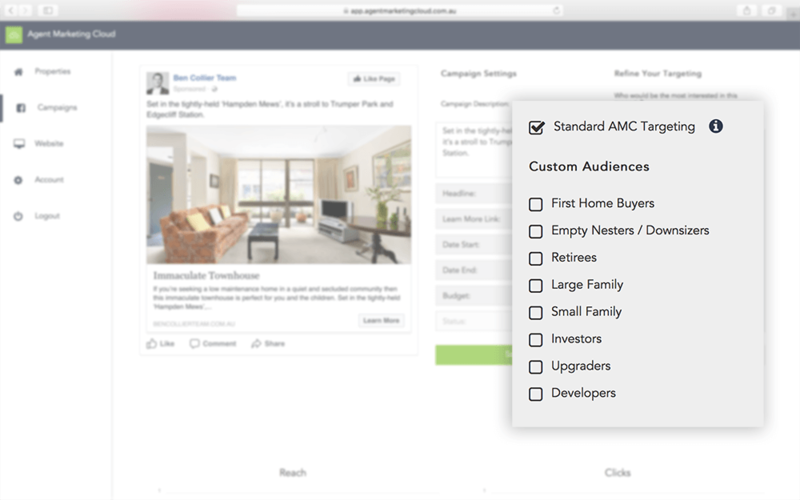 We’ve tried, tweaked, tested and refined a selection of audience segments to give real estate agents the power to target in-market buyers and sellers. Some of our clients have seen a 75% decrease in the cost-per-view compared to their spend on the major portals. If standing out at a listing presentation is important to you, you’re going to love our Vendor Preview reports. 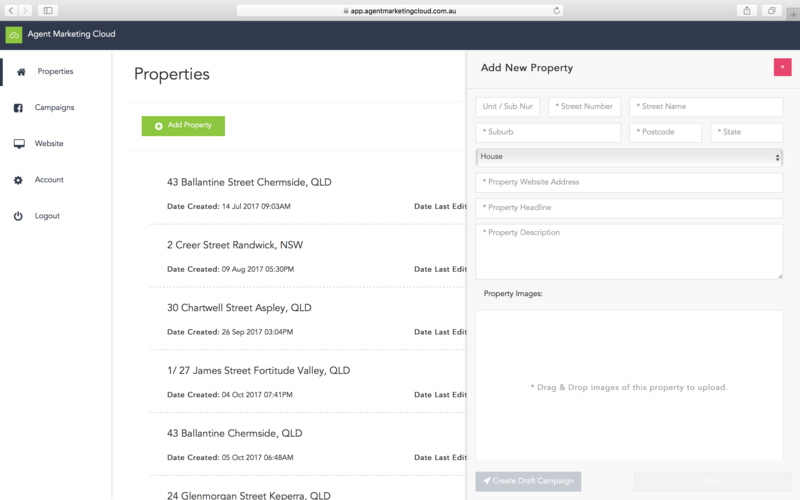 Upload some basic property details and voila! Download a pre-listing Facebook Ad preview with campaign performance estimates, budget suggestions and targeting descriptions – all branded just for you. Powerful Facebook Ads platform, built specifically for real estate. Some of our clients have seen a 75% increase in page views over their major portal ads. Generate jaw-dropping pre-listing vendor previews to show your potential clients why your marketing is more powerful than your competitors. Your ads are connected to your Facebook Page and interested buyers are sent to your website. No need to learn Facebook’s complicated Ad Manager platform. We’ve built a simplified version, just for real estate. Choose from advanced audience segments at a click of a button. Including first home buyers, developers, downsizers, empty nesters, developers and more. Choose from image type ads or upload a video. Start generating more buyer and seller leads with less work, at a lower cost. You’re about to start driving more leads and sales. Contact us today about Vendor Lead Sites. Good marketing starts with great content. Request Access To Agent Marketing Cloud’s Facebook Ads platform. See for yourself why Australia’s leading agents trust Agent Marketing Cloud to attract buyer leads. Apply to be an Agent Marketing Cloud partner.